When the New Testament, and especially Jesus himself forbids us more than once to judge or to condemn, it does not refer to a situation in which a competent and objective evaluation ation is required, but rather to those cases in which we assess the other unwisely and unfairly. "Stop judging, that you may not be judged. For as you judge, so will you be judged, and the measure with which you measure will be measured out to you" (Mt 7:1-2). Luke's gospel adds, "Stop condemning and you will not be condemned" (Lk 6:37). In his letter to the Romans, St. Paul writes, 'Why then do you judge your brother er [or sister]? Or you, why do you look down on your brother er [or sister]? For we shall all stand before the judgment seat of God" (Rom 14:10). The good news forbids us time and time again from judging. And yet in ecclesiastical circles this happens pens quite often. It almost looks like an aberration: an obsessive sive tendency to judge. We have, no doubt, a very extensive network of detailed norms and rules; if we use them to judge another, then we act contrary to the gospel. Moreover, we can make enormous mistakes in this regard. If we are not unselfish enough and free enough, if we do not lovingly behold the other as other, then we commit an injustice against the other person. There is a story which might help us to be careful in judging ing or drawing hasty conclusions. In Germany there are fast food places where one may stand at high tables to eat. A woman goes into such a place for a quick lunch. She buys a bowl of soup and a sausage sandwich which she carefully carries ries to an empty table. She places the soup on the table, hangs her purse underneath, and then realizes that she has forgotten a spoon. She returns to the counter to pick up a spoon and a napkin, which she had also forgotten. When she goes back to her table, lo and behold, a stranger is happily spooning her soup. He doesn't look like a German; his dark complexion suggests gests an origin in Italy, Greece, or perhaps Turkey. And that man is eating her soup! First, she is flabbergasted. Then, seconds onds later, an enormous anger takes hold of her; she could have killed him on the spot! Another ten seconds later, she has pulled herself together and decides: he is brazen-well, so am 1! She resolutely strides to the opposite side of the table and starts eating from the same bowl. One would expect that the man would apologize and disappear. Far from it. He quietly continues to eat, smiling. Apparently he does not understand German, so verbal communication is impossible. But he is extremely friendly and his smile is his weapon. He is not in the least bit intimidated. The strongest provocation comes when he offers her half of her own sausage. At the end of this awkwardly wardly shared meal, he even extends his hand to her. By now she has calmed down enough to accept his handshake. He leaves, and she reaches for her purse. It is gone! She had known it from the beginning-that he was a thief, and now he even stole her purse. She runs to the door, but he has disappeared. She finds herself in a very hopeless situation; her credit cards, driver's license, and all her money were all stolen. Helplessly, she scans the room and then discovers, at the adjacent cent table, a bowl of soup (by now cold), a sausage sandwich (untouched) and her purse hanging underneath! During all that time it had never occurred to her that it might be possible ble that she, not he, was mistaken. Reflection on our own lives will surely provide other examples of how easily we, convinced of our own right, fail to perceive the real truth of a situation. The parable of the prodigal son (or more accurately of the merciful father") is called evangelium in evangelio, the gospel within the gospel, the heart of the good news of Jesus. It is so simple that a child understands it and so profound that no person can fully plumb the depths of it. The story begins with the request of the younger son for his share of the inheritance. itance. He is entitled to it, but he wants it prematurely. He cannot wait until his father has died; he wants it right away. He wants now what should be given to him later. He makes his rude and self-serving claim without any respect for the feelings of the one who gives it to him. He demands an autonomy omy which ignores the existing dependence. The father respects the free will of his son even though the latter abuses that freedom. The father is a wise man who understands that this departure is inevitable no force in the world can prevent it. He exerts no pressure, no pressure to stay nor any pressure to return. With that respect he gives his son a most precious gift which will later make a return possible. ble. God never coerces. Here we see the greatness of God's power and the openness of God's love. God surely wants to gain our affection and our dedication, but God always leaves us completely free. Even in the most critical of situations, God respects our freedom. When prayer seems lacking in fruitfulness: Jesus says that whoever loses his life for my sake, will find it. Similarly, it can be said of prayer that whoever loses her time for Jesus' sake will discover that it becomes the most precious time. Waste your time for Jesus' sake. You will not be disappointed. 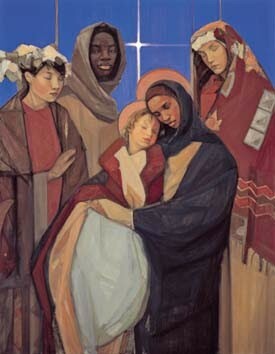 We don't know much about the Magi in Matthew's gospel but we do know that following them is a long line of wise women and men who seek the One who saves us. With gifts in their hands and crowns in their hair. Following, yes, that guiding star. Is a marvelous sight we must not miss!" Gathered to gaze at a mother and child. And a lingering, lasting, cradle-song. Toward home and children and chores undone. There are many faces to a baby. When you think about it, a baby is an amazing symbol of both power and powerlessness. Or, perhaps, more accurately, a baby is a symbol of power within powerlessness. When loving couples have a baby they become as vulnerable and precarious as the baby of their love. The beauty they have created shatters their former security. Their lives are irrevocably transformed. But that is what love is like. It surrenders. It has no more masks, no more expectations, no more certainties. The Bethlehem baby’s defenseless presence, his shocking and precarious weakness, his overturning all our ideas about the nature of God, stuns us into silence. It is in this sacred silence, during the few precious days of Christmas, that the hard thoughts within us will melt, that the unforgiving walls of judgment and blame will crumble, and that the shadow of all our pride will be transformed by by the light of an infant’s smile. Such is the power of a baby. We have tended to assume that Jesus became human like us, but now, we discover that we are invited to become human like him. Jesus is the original, in whose likeness we are dreamed.' Jane Williams, The Art of Advent. You quiet the unloving and fearful. And man that you do delight in him? You have made us co-creators of the earth! You have placed in our hands. How powerful is your Name in all the earth! To adore what they behold in you.
. . . And let us go forth to behold ourselves in your beauty. When we read poetry as beautiful and profound as this verse, we can see why John of the Cross (1542–1591) was far ahead of his time in the spiritual and psychological understanding of how love works and how it changes us at a deep level. He consistently speaks of divine love as the template and model for all human love, and human love as the necessary school and preparation for any transcendent encounter. You give a piece of yourself to the other. You see a piece of yourself in the other (usually unconsciously). This allows the other to do the same in return. one that fully satisfies and creates an immense Inner Aliveness. Simply to love is its own reward. You accept being accepted—for no reason and by no criteria whatsoever! This is the key that unlocks everything in me, for others, and toward God. So much so that we call it “salvation”! To put it another way, what I let God see and accept in me also becomes what I can see and accept in myself. And even more, it becomes that whereby I see everything else. This is why it is crucial to allow God and at least one other person to see us in our imperfection and even in our nakedness, as we are—rather than as we ideally wish to be. It is also why we must give others this same experience of being looked upon in their imperfection; otherwise, they will never know the essential and utterly transformative mystery of grace. This is the glue that binds the universe of persons together. Such utterly free and gratuitous love is the only love that validates, transforms, and changes us at the deepest levels of consciousness. It is what we all desire and what we were created for. Once we allow it for ourselves, we will almost naturally become a conduit of the same for others. In fact, nothing else will attract us anymore or even make much sense. Can you let God “look upon you in your lowliness,” as Mary put it (Luke 1:48), without waiting for some future moment when you believe you are worthy? Simply love what God sees in you. Many of us never go there, because to be loved in this way is to live in the naked now, and it is indeed a very naked moment. A salt doll journeyed for thousands of miles over land, until it finally came to the sea. It was fascinated by this strange moving mass, quite unlike anything it had ever seen before. “Who are you?” said the salt doll to the sea. "When you live in the past with its mistakes and regrets, it is hard. I am not there. When you live in the future, with its problems and fears, it is hard. I am not there. My name is not I WILL BE . My name is I AM ." God lost and found. John Pritchard pg 73. Christian faith is therefore best seen as a quest for deep wisdom. To make it into a package of certainties is to demean the Creator and open ourselves to misunderstanding or irrelevance. If we have struggled with God, or lost sight and sound of God, perhaps it’s worth stepping back from too much certainty and sense of ‘arrival’ and allowing faith to be a quest (and indeed a question). The honesty of the humbler path means that we can spend a lifetime on a journey of joyful exploration of a God who will always leave us speechless. The journey may well take us into the mystical way of silent encounter, when words fall away and Presence speaks straight to the heart. Or the journey may take us back to the person of Jesus, the person in whom the divine lightning finally struck the earth (of whom more later in Chapter 11). Either way, we can step back to a less assertive position and turn our longing gaze to a gentler God. "My Lord God, I have no idea where I am going. I do not see the road ahead of me. I cannot know for certain where it will end. Nor do I really know myself, and the fact that I think I am following your will does not mean that I am actually doing so. But I believe that the desire to please you does in fact please you. And I hope I have that desire in all that I am doing. I hope that I will never do anything apart from that desire. And I know that if I do this you will lead me by the right road, though I may know nothing about it. Therefore I will trust you always though I may seem to be lost and in the shadow of death. I will not fear, for you are ever with me, and you will never leave me to face my perils alone." I would like to offer one more counsel to those who find themselves devoid of the presence of God. It is this: wait on God. Wait, silent and still. Wait, attentive and responsive. Learn that trust precedes faith. Faith is a little like putting your car into gear, and right now you cannot exercise faith, you cannot move forward. Do not berate yourself for this. But when you are unable to put your spiritual life into drive, do not put it into reverse; put it into neutral. Trust is how you put your spiritual life in neutral. Trust is confidence in the character of God. Firmly and deliberately you say, ‘I do not understand what God is doing or even where God is, but I know that he is out to do me good.’ This is trust. This is how to wait. I do not fully understand the reasons for the wildernesses of God’s absence. This I do know; while the wilderness is necessary, it is never meant to be permanent. In God’s time and in God’s way the desert will give way to a land flowing with milk and honey. GOD, WHERE ARE YOU!? What have I done to make you hide from me? Are you playing cat and mouse with me or are your purposes larger than my perceptions? I feel alone, lost, forsaken. You are the God who specializes in revealing yourself. You showed yourself to Abraham, Isaac and Jacob. When Moses wanted to know what you looked like, you obliged him. Why them and not me? I am tired of praying. I am tired of asking. I am tired of waiting. But I will keep on praying and asking and waiting because I have nowhere else to go. Jesus, you too knew the loneliness of the desert and the isolation of the cross. And it is through your forsaken prayer that I speak these words. That is the next thing that should be said about our sense of the absence of God, namely that we are entering into a living relationship that begins and develops in mutual freedom. God grants us perfect freedom because he desires creatures who freely choose to be in relationship with him. Through the Prayer of the Forsaken we are learning to give to God the same freedom. Relationships of this kind can never be manipulated or forced. If we could make the Creator of heaven and earth instantly appear at our beck and call, we would not be in communion with the God of Abraham, Isaac and Jacob. We do that with objects, with things, with idols. But God, the great iconoclast, is constantly smashing our false images of who he is and what he is like. Can you see how our very sense of the absence of God is, therefore, an unsuspected grace? In the very act of hiddenness God is slowly weaning us from fashioning him in our own image. Like Aslan, the Christ figure in The Chronicles of Narnia, God is wild and free and comes at will. By refusing to be a puppet on our string or a genie in our bottle, God frees us from our false, idolatrous images. Besides, we should probably be thankful that God does not always present himself whenever we wish, because we might not be able to endure such a meeting. Christians down through the centuries have witnessed the same experience. St John of the Cross named it ‘the dark night of the soul’. An anonymous English writer identified it as ‘the cloud of unknowing’. Jean-Pierre de Caussade called it ‘the dark night of faith’. George Fox said simply, ‘When it was day I wished for night, and when it was night I wished for day.’ 2 Be encouraged –you and I are in good company. In addition I want you to know that to be faced with the ‘withering winds of God’s hiddenness’ 3 does not mean that God is displeased with you, or that you are insensitive to the work of God’s Spirit, or that you have committed some horrendous offence against heaven, or that there is something wrong with you, or anything. Darkness is a definite experience of prayer. It is to be expected, even embraced. TAILOR-MADE JOURNEY The second thing that can be said about our experience of abandonment is that every faith journey is tailor-made. Our sense of God’s absence does not come to us in any present timetable. We cannot simply draw some universal road map that everyone will be able to follow. It is true that those in the first flush of faith are often given unusual graces of the Spirit, just as a new baby is cuddled and pampered. It is also true that some of the deepest experiences of alienation and separation from God have come to those who have travelled far into the interior realms of faith. But we can enter the bleak deserts of barrenness and the dark canyons of anguish at any number of points in our sojourn. The Second Collect for the Week after Ascension. Such a beautiful collect, which sums up the experience of absence of God as we continue in contemplation, which can be a worry for us, or a mystical reality we enter into. May 8th Sr Juliana's 34th profession anniversary, on Julian on Norwich's Day. and doing all things well. Our hazel nut of praise.